Don't worry about this adjustable desk wobbling like some competitor products. This is heavy duty and supports a whopping 30 lbs of weight. It uses one simple, easy to use hand lever to adjust up and down. *Standing height is 3 inches to 14 inches. Perfect for anyone from 5ft to 6ft 1in. Adjustable heights are 3-inches, 6.5-inches, 10-inches, and 14-inches. Inside you will find a fully assembled adjustable height desk. 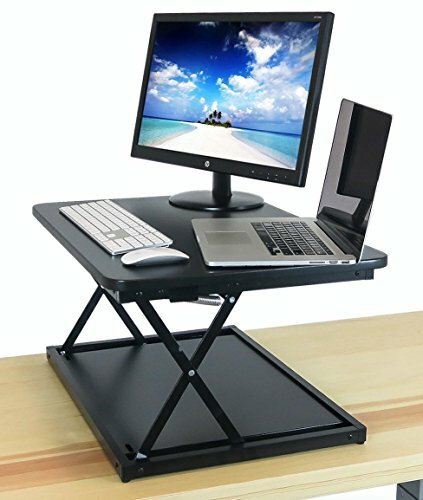 Adjustable Height Standing Desk or Monitor Stand from 3 to 14 in High. Great sit stand desk for small spaces. HEAVY DUTY Supports up to 30 lbs. Doesn't wobble like cheap alternatives. Ships FULLY ASSEMBLED. VERY EASY to adjust heights up and down. Uses proprietary spring loaded hand lever. Just squeeze and lift. Sit or stand in comfort with smooth height adjustment up to 14" above your desk surface with 4 incremental height options (3in, 6.5in, 10in, and 14in). Overall dimensions are 28 in Wide x 20 in Deep x 3 to 14 in High. Small footprint is perfect for cubicles or small office spaces.